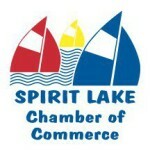 Thank you for your interest in visiting Spirit Lake, Iowa! Situated in the heart of what is known as Iowa’s Great Lakes/Okoboji Region, Spirit Lake and the surrounding area offers visitors year-round recreation. From swimming and fishing, to shopping, art, theater and dining venues, Spirit Lake is a great place to live, work and play! Spirit Lake is easy to get to by car. We’re 15 minutes south of I-90 at Jackson, MN; we are within 3-4 hours of Omaha, Sioux City, Des Moines and Sioux Falls. Area Accommodations – From B&Bs to campgrounds, hotels to resorts, here is your list of places to stay while visiting Spirit Lake.